THE SURVEYS HAVE GONE OUT! Due to the structure of our reward levels, we are listing all available rewards in each survey. This is in case backers, either at lower or higher levels, increased their pledge amounts to include additional reward choices. 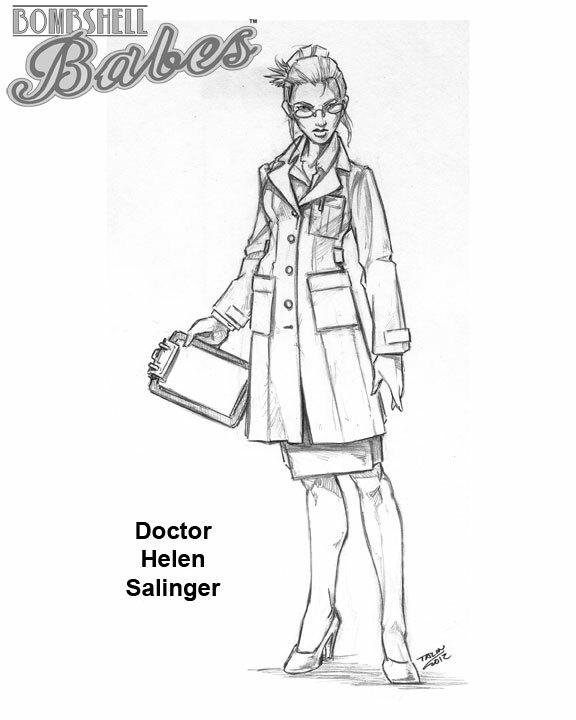 As a special ‘thank you’ to all our Kickstarter backers, we will be sending a Doctor Helen Salinger Babe to each of you (see Update #28). That is why we are requesting address information from all pledge levels. PLEASE NOTE: In order to complete the survey, all fields MUST have an entry, even if it is ‘0’, ‘none’, or ‘n/a’. In order to process your pledge rewards in a timely fashion, we need to have your surveys completed by Wednesday, December 19, 2012. Thank you again for supporting our project! Images for all of the rewards options can be seen on the Kickstarter Images Page. We need to have the data back to set printing quantities for our vendors. 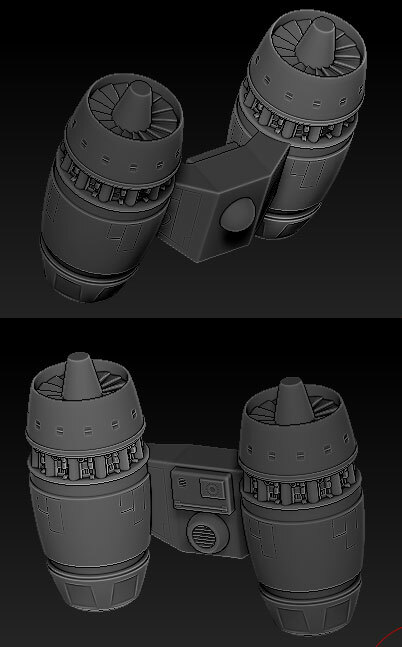 I will be posting more images of sculpts between now and the “deadline”. Do not enter any quantities for PayPal Donate items on your Kickstarter Survey. DO NOT list quantities for stuff you are ALREADY GETTING FOR FREE. In other words, the items that are already included in the Bomb Kit is stuff you will get anyway without choice. Only add quantities for your CHOICES and EXTRA items. The PayPal Donate page is separate. You can enter your PayPal Donate rewards choices in the text box on the PayPal Donate form or email info@bombshellminis.com with the items for PayPal Donate. We will match them up for shipping. 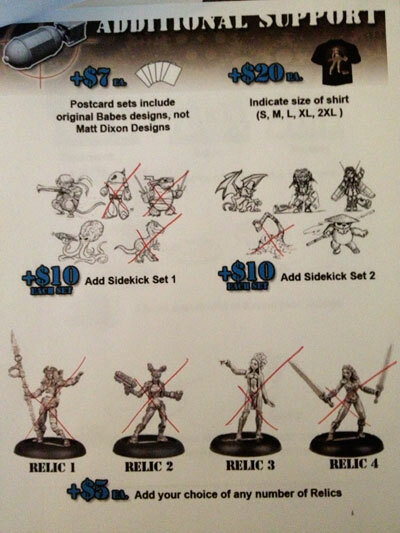 If you feel you have made an error on your survey send me a PRIVATE MESSAGE through the Kickstarter site and I will notate your pledge survey so you get the items you want. I am frantically trying to get everything collected to make our trip to Reaper tomorrow and there’s lots of sculpting left. That means a late night with coffee is likely. 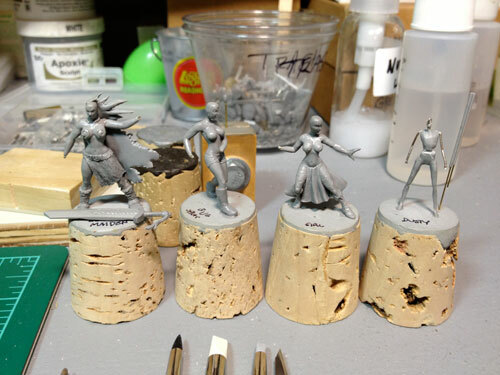 The bases have arrived at Valiant and I am awaiting a price quote for the production quantities. 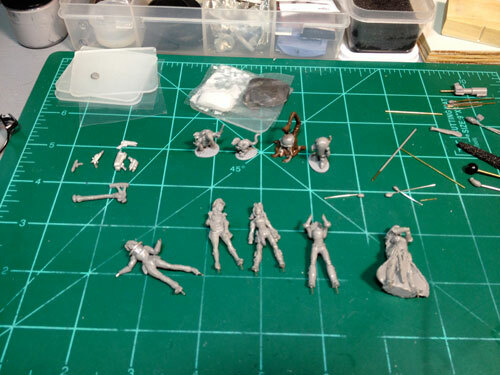 Our 3D print vendor has shipped out the base tabs with the Bombshell imprint which should be arriving today. They are also printing Maelee’s wrench and Sally’s rocket pack. i hope to have both of these to take to mold tomorrow. 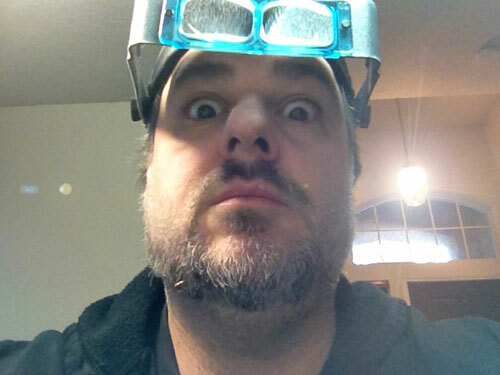 Here is my view from the workbench . 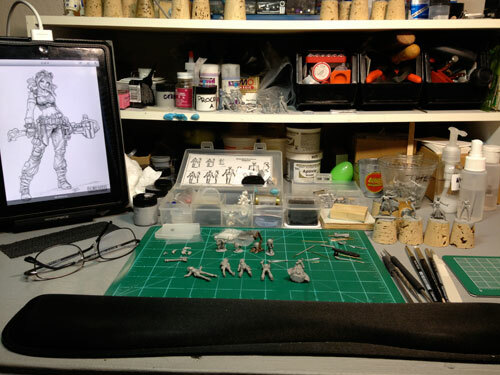 . .
and here is my view OF the workbench . . . Final details are being added to the girls. Some of the them still need lots more work than others. 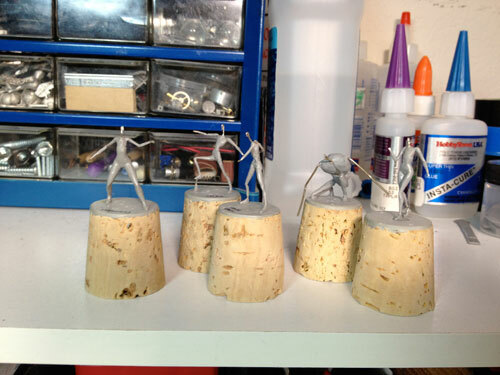 These are the armatures for the next batch, Meagan, Mira, Cave Girl and the Atomic Punks. 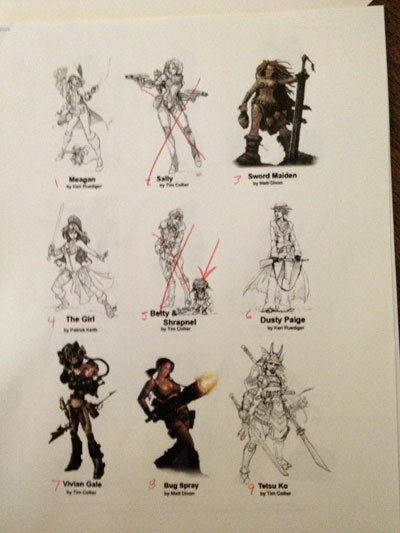 I have also printed out the Kickstarter images for reference. This will help me keep track of what’s ready to go to mold and what is left. There will be another update of the final pics for this first batch of Babes before they go to mold. 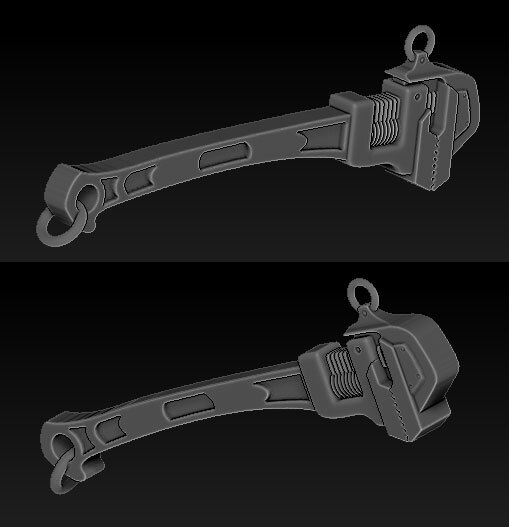 I will be updating the Sculpt Gallery and will post another update once they are ready. I have contacted the artists to get the rest of the art for the Postcard sets so we can send those for printing next week. Plus, I will be painting the pieces I designed and will post the art for those, too. We need to get the metrics back from the surveys so we can send the quantities to our printer for the T-shirts. Anyway, much to do! Back to it . . . .